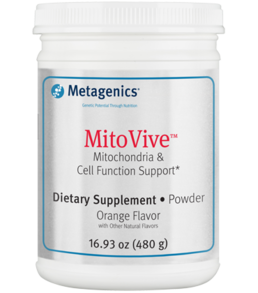 Metagenics Metagenics MitoVive 16.93 oz. https://www.naturescountrystore.com/media/ecom/prodsm/mitovive-large_1.png Mitochondria & Cell Function Support* Health & Beauty > Health Care > Fitness & Nutrition > Vitamins & Supplements MetagMitoVive 39.95 Nature's Country Store new in stock https://www.naturescountrystore.com/Item/MetagenicsMitoVive16.93 oz. Store Home > Metagenics MitoVive 16.93 oz. MitoVive™ is designed to support healthy functioning of mitochondria—the powerhouses of the cell—and overall cell activity to help relieve muscle discomfort and promote soft tissue health. * This formula features targeted amino acids (i.e., L-carnitine, taurine), magnesium, and other nutrients in an easy-to-use, powdered delivery form. This product is Gluten Free and Vegetarian. Directions: Blend, shake, or briskly stir 1 scoop (16g) into 4-6 oz of chilled water, or as directed by your healthcare practitioner. color), and rebaudioside A(Stevia rebaudiana leaf extract). Formulated to Exclude: Wheat, gluten, soy, dairy products, egg, nuts, tree nuts, fish, crustacean shellfish, artificial sweeteners, artificial flavors, and preservatives. Storage: Keep tighly closed in a cool, dry place.